The CPlane command sets the origin and orientation of the construction plane in the active viewport. A construction plane is like a tabletop that the cursor normally moves on. The construction plane has an origin, x and y axes, and a grid. The construction plane can be set to any orientation, and each viewport’s construction plane is independent of those in other viewports. The construction plane represents the local coordinate system for the viewport and can be different from the world coordinate system. Rhino’s standard viewports come with construction planes that correspond to the viewport. The default Perspective viewport, however, uses the world Top construction plane, which is the same construction plane that is used in the Top viewport. Pick a new origin point or choose an option. The construction planes in all viewports change so their origin is at the picked location. The Curve option sets the construction plane perpendicular to a curve. Select a curve to orient construction plane. Drag the construction plane's new x and y axes to a new location. Use the Curve option to quickly position your construction plane at various stations along a central rail curve as preparation for doing a one rail sweep, for example. Once your construction plane is positioned, you can use drawing tools to draw a cross-section curve in the 3 D location where it needs to be. This direct drawing method can be quicker and more convenient than drawing the curve on a world plane and then trying to move and rotate it into place in 3‑D. The direction of the curve affects the direction of the axes. If the construction plane does not go the direction you want, flip the direction of the curve with the Flip or Dir commands. Type subcrv to select part of a curve as input. The Elevation option changes the elevation (z direction) of the construction plane. Type a distance to move the origin from its previous location. Positive numbers move the construction plane up along the positive z axis. Negative numbers move the construction plane down. The Gumball option sets the construction plane to match the gumball orientation of the currently selected object. The Object option sets the construction plane in the active viewport to an object. Select a curve, surface, or mesh face. The origin and tangency of the new construction plane is based on the "midpoint" of the untrimmed version of the surface. In the case of a mesh face, the plane goes to the center of the face and the face normal determines the construction plane z direction. In the case of a circle or an arc, the origin will be placed at the center. The X-axis will point to the start point. The Y-axis will be 90 degrees away from the start point in the curve direction. The Rotate option rotates the construction plane. Pick the start of the rotation axis. Pick the end of the rotation axis. Type the angle to rotate the construction plane. Pick two points to specify the angle. The Surface option sets the construction plane to match a surface. The placement is constrained so that the construction plane is tangent to the surface. Pick an origin or press Enter. Pick an x axis direction or press Enter. Uses entire untrimmed underlying surface. 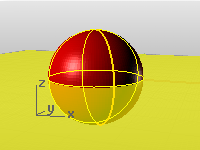 Moves the construction plane in the current viewport in its z direction, so its xy plane intersect the selected point. Pick a location to move the CPlane in its z direction. Moves the construction planes in all viewports in their z directions, so their xy planes intersect the selected point. Sets the construction plane in the active viewport parallel to the view. Click View or type V.
Restores the specified default construction plane. The 3Point option sets the construction plane in the active viewport by specifying points to establish the x, y, and z directions. Pick a new origin, or press Enter. Sets the construction plane perpendicular to the current construction plane. Sets the construction plane z axis direction. Restores the previously used construction plane in the current viewport. Click Undo or type U.
Restores the construction plane that was active before the Undo option was used. Click Redo or type D.
The CopyCPlaneToAll command changes all viewports to have the same construction planes as the specified viewport. The CopyCPlaneSettingsToAll command changes all viewports to have the same grid settings and snap spacing as the specified viewport. Set up a relationship between a construction plane and an object. Manage the named construction planes list.